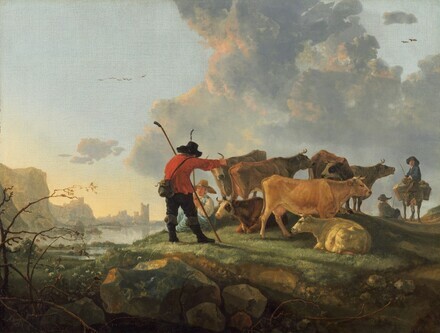 Arthur K. Wheelock Jr., “Aelbert Cuyp/Herdsmen Tending Cattle/1655/1660,” Dutch Paintings of the Seventeenth Century, NGA Online Editions, https://purl.org/nga/collection/artobject/66 (accessed April 18, 2019). Aelbert Cuyp’s painting of herdsmen and cattle along a river with an evocative ruin in the background is more pastoral than agricultural in its associations. In this respect it parallels a rich literary tradition glorifying the values of rural life. The herdsman in the bright red jacket seems to be getting his cows ready to return to the farmstead, if only he can convince his female companion to abandon this lovely spot on the riverbank. Many of the components of this work—the golden light, the atmospheric character of the distant landscape with its dramatic ruins, the diffused golden light that casts long shadows, the abstract shapes of the rocks and branches in the foreground—show the influence of the Italianate style of Jan Both (1615/1618–1652) and other Dutch artists who had worked in Italy. Lambert van den Bos, for example, the headmaster of a local school in Dordrecht, wrote a book entitled Dordrechtsche Arcadia in 1662. For Jacob Gerritsz Cuyp, see Sander Paarlberg, ed., Jacob Gerritsz Cuyp (1594–1652) (Dordrecht, 2002). By the time Cuyp executed this work his style had evolved to the point where the rhythms of the landscape, the foliage, and the clouds had been fully transformed. Even though the theme has Dutch precedents and the ruin in the background is a free adaptation of the Merwede Tower near Dordrecht, one no longer has the sense that the setting is specific to the Netherlands. Cliffs, diffused in golden light, now border the inland waterway; clouds hang quietly over the land rather than being swept by winds off the North Sea; and the cowherd in the bright red jacket could just as well be Italian as Dutch. Indeed, in the interim between River Landscape with Cows and this picture, the influences of Cuyp’s father and of Jan van Goyen (Dutch, 1596 - 1656) have been fully replaced by that of artists who had returned from Italy and had adopted the Italianate style, particularly Jan Both (Dutch, 1615/1618 - 1652) and Jan Baptist Weenix (1621–1660/1661). From these artists Cuyp also derived his broad, planar technique as well as the elegant and artificial rhythms of the foreground vines and branches one sees here. Although it seems probable that Cuyp executed Herdsmen Tending Cattle in the middle to late 1650s, establishing a precise date for this work is difficult given the dearth of dated paintings in his oeuvre. Many of the components of this work—the contre-jour light effects, the atmospheric character of the distant landscape, the abstract shapes of foreground rocks and lacy branches, and even the donkey and its saddle—are similar in character to Horsemen and Herdsmen with Cattle, a painting that probably dates from the same period. The comparison between the works, however, points out that the nuances of light, abstractions of form, and compositional organization are not as developed in Herdsmen Tending Cattle as in Horsemen and Herdsmen with Cattle, which suggests that this work was executed somewhat earlier, before Cuyp had fully mastered Italianate ideas. See the 1995 archived version of the catalog, p. 46, fig. 1. 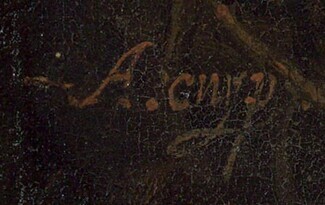 In addition to the Ash copy of the composition, a replica is owned by Dr. Wallace B. Shute of Ottawa. Possibly Gerard Vandergucht [1696-1776], London, c. 1750; possibly (his sale, London, 1757, no. 66); Jennens, possibly for Henry Penton [d. 1806], London; (his sale, Skinner & Dyke, London, 10 June 1800, no. 49); Sir Henry Paulet St. John-Mildmay, 3rd bt. [1764-1808], Dogmersfield House, Hampshire; by inheritance to his wife, Lady Jane St. John-Mildmay [c. 1765-1857], Dogmersfield House; by inheritance to her grandson, Sir Henry Bouverie Paulet St. John-Mildmay, 5th bt. [1810-1902], Dogmersfield House; by inheritance to his son, Sir Henry Paulet St. John-Mildmay, 6th bt. [1853-1916], Dogmersfield House; (M. Knoedler & Co., New York), from 1902; sold April 1905 to Andrew W. Mellon, Pittsburgh and Washington, D.C.; deeded 28 December 1934 to The A.W. Mellon Educational and Charitable Trust, Pittsburgh; gift 1937 to NGA. The only source to mention Vandergucht (also written van der Gucht) is the Knoedler prospectus for the painting, in NGA curatorial files, which mistakenly lists the Vandergucht sale of 1777 that did not include any paintings by Cuyp. See instead Frank Simpson, “Dutch Paintings in England before 1760,” The Burlington Magazine 95 (January 1953): 41, who lists a "Landscape with Cattle, etc." by Cuyp as being no. 66 in a 1757 Vandergucht sale in London, where it was bought by “Jennens.” The listing appears in one of two manuscript volumes in the Victoria and Albert Museum library, London, that contain transcripts of catalogues of the principal collections of paintings sold in England between 1711 and 1759. Jennens was likely Charles Jennens, whom Simpson describes as having brought together by the mid-eighteenth century the largest collection of Dutch paintings then in England. Without further description or size information in the transcription, however, it is not possible to know whether the painting in question is identical to Herdsmen Tending Cattle. The Knoedler prospectus, in NGA curatorial files, says that Penton acquired the painting at the Vandergucht sale. Penton certainly owned the picture by 1760, the date on François Vivares’ reproductive engraving, entitled The Evening. It depicts the composition in reverse but, with the exception of a group of two birds, it is otherwise identical. This print is listed in Charles LeBlanc, Manuel de l’amateur d’estampes, 4 vols., Paris, 1854: 4:141, no. 20; and Andreas Andresen, Handbuch für Kupferstichsammler..., 2 vols., Leipzig, 1873: 2:678, no. 17. British Institution for Promoting the Fine Arts in the United Kingdom, London, 1866, no. 43. Works by Old Masters and by Deceased Masters of the British School. Winter Exhibition, Royal Academy of Arts, London, 1883, no. 243. Loan Collection of Pictures, Art Gallery of the Corporation of London, Guildhall, London, 1894, no. 51. Exhibition of a Selection of Works by Early and Modern Painters of the Dutch School, Art Gallery of the Corporation of London, Guildhall, London, 1903, no. 176. Paintings by Old Masters from Pittsburgh Collections, Carnegie Institute, Pittsburgh, 1925, no. 10. Time and Transformation in Dutch Seventeenth Century Art, The Frances Lehman Loeb Art Center, Vassar College, Poughkeepsie; The John and Mable Ringling Museum of Art, Sarasota; The Speed Art Museum, Louisville, 2005-2006, no. 13, repro. The original, plain-woven, medium-weight fabric support has been lined. Tacking margins have been removed, and the remaining paint edges are worn. Cusping is slight on all sides but particularly along the left edge, suggesting that the painting’s dimensions may have been slightly reduced along that side. A large paint loss and a long horizontal tear are present in the upper left sky. The ground is of medium thickness, is pigmented, and has a cool, pale ocher color. The paint, applied in thin layers with no appreciable texture or impasto, is modified with transparent and translucent glazes and thin opaque scumbles. Aside from the loss around the tear, scattered small losses occur in the distant landscape, along the edges, and in a vertical band through the cows. Moderate abrasion is present overall, particularly in the clouds and dark areas in the foreground and cows. Conservation was carried out in 1958 to adjust inpainting in the sky and in 1978 to consolidate minor local flaking. A complete treatment was undertaken in 1994 in which old inpaint and discolored varnish were removed. If the painting was reduced in size, the reduction took place prior to 1760. This is the date on a reproductive engraving by Francois Vivares, which shows the identical composition in reverse, except for a pair of birds. During this treatment the NGA Scientific Research department analyzed the blue pigment used in the sky using polarized light microscopy and found it to be smalt (see report dated February 17, 1994, in NGA Conservation department files). Burnet, John. Practical hints on light and shade in painting. London, 1826: 26-27, pl. 6, fig. 1 (etching). Smith, John. A Catalogue Raisonné of the Works of the Most Eminent Dutch, Flemish and French Painters. 9 vols. London, 1829-1842: 5(1834):305, no. 75. Burnet, John. "Practical Hints on Light and Shade in Painting." In A Treatise on Painting in Four Parts. Reprint. London, 1850: Part 3:26-27, pl. 6, fig. 1 (etching). British Institution for Promoting the Fine Arts in the United Kingdom. Catalogue of pictures by Italian, Spanish, Flemish, Dutch, Franch, and English masters. Exh. cat. British Institution. London, 1866: no. 43. Burnet, John. "Practical Hints on Light and Shade in Painting." In A Treatise on Painting in Four Parts. Reprint. London, 1880: Part 2:26-27, pl. 6, fig. 1 (etching). Royal Academy of Arts. Exhibition of works by the old masters, and by deceased masters of the British School. Winter Exhibition. Exh. cat. Royal Academy of Arts, London, 1882: 28, no. 243. Cundall, Frank. The Landscape and Pastoral Painters of Holland: Ruisdael, Hobbema, Cuijp, Potter. Illustrated biographies of the great artists. London, 1891: 161. Temple, Alfred G. Masterpieces of Art. Exh. cat. Art Gallery of the Corporation of London, 1894: 14, repro. Hofstede de Groot, Cornelis. A Catalogue Raisonné of the Works of the Most Eminent Dutch Painters of the Seventeenth Century. 8 vols. Translated by Edward G. Hawke. London, 1907-1927: 2(1909):68, no. 203. Hofstede de Groot, Cornelis. Beschreibendes und kritisches Verzeichnis der Werke der hervorragendsten holländischen Maler des XVII. Jahrhunderts. 10 vols. Esslingen and Paris, 1907-1928: 2(1908):68, no. 203. Graves, Algernon. A Century of Loan Exhibitions, 1813-1912. 5 vols. London, 1913-1915: 1(1913):245, 247, 250. Carnegie Institute. An Exhibition of Paintings by Old Masters from the Pittsburgh Collections. Exh. cat. Carnegie Institute, Pittsburgh, 1925: no. 10. Preliminary Catalogue of Paintings and Sculpture. National Gallery of Art, Washington, 1941: 50-51, no. 59. Book of Illustrations. National Gallery of Art, Washington, 1942: 240, repro. 23. National Gallery of Art. Paintings and Sculpture from the Mellon Collection. Washington, 1949 (reprinted 1953 and 1958): 96, no. 59, repro. Walker, John. National Gallery of Art, Washington, D.C. New York, 1963 (reprinted 1964 in French, German, and Spanish): 314, repro. National Gallery of Art. Summary Catalogue of European Paintings and Sculpture. Washington, 1965: 35. National Gallery of Art. European Paintings and Sculpture, Illustrations. Washington, 1968: 28, repro. National Gallery of Art. European paintings: An Illustrated Summary Catalogue. Washington, 1975: 88, repro. Reiss, Stephen. Aelbert Cuyp. Boston, 1975: 129, no. 92, repro. Walker, John. National Gallery of Art, Washington. New York, 1975: 298, no. 402, color repro. Spicer, Joaneath A. "'De Koe voor d’aerde statt': The Origin of the Dutch Cattle Piece." In Essays in Northern European Art Presented to Egbert Haverkamp-Begemann on His Sixtieth Birthday. Edited by Anne-Marie Logan. Doornspijk, 1983: 251-253, fig. 2. Walker, John. National Gallery of Art, Washington. Rev. ed. New York, 1984: 298, no. 396, color repro. National Gallery of Art. European Paintings: An Illustrated Catalogue. Washington, 1985: 109, repro. Sutton, Peter C. A Guide to Dutch Art in America. Washington and Grand Rapids, 1986: 306, fig. 456. Kopper, Philip. America's National Gallery of Art: A Gift to the Nation. New York, 1991: 54, 73, color repro. Chong, Alan. "Aelbert Cuyp and the Meanings of Landscape." Ph.D. dissertation, New York University, 1992: 509, no. Calr. 12. Wheelock, Arthur K., Jr. Dutch Paintings of the Seventeenth Century. The Collections of the National Gallery of Art Systematic Catalogue. Washington, 1995: 44-46, color repro. 45. Wheelock, Arthur K., Jr. Aelbert Cuyp. Exh. cat. National Gallery of Art, Washington; National Gallery, London; Rijksmuseum, Amsterdam. Washington, 2001: 29, fig. 20. George S. Keyes, et al. Masters of Dutch Painting: The Detroit Institute of Arts. London, 2004: 62, fig. 2. Kuretsky, Susan Donahue. Time and Transformation in Seventeenth-Century Dutch Art. Exh. cat. Frances Lehman Loeb Art Center, Vassar College, Poughkeepsie; John and Mable Ringling Museum of Art, Sarasota; J.B. Speed Art Museum, Louisville. Seattle, 2005: 24, 135-137, no. 13. For Jacob Gerritsz Cuyp, see Sander Paarlberg, ed., Jacob Gerritsz Cuyp (1594–1652) (Dordrecht, 2002). Applying opaque or semi-opaque, dry paint so that it partially covers and modifies the color below.]. Aside from the loss around the tear, scattered small losses occur in the distant landscape, along the edges, and in a vertical band through the cows. Moderate abrasion is present overall, particularly in the clouds and dark areas in the foreground and cows.